Red icewines are unique, since traditionally icewines have been white. Grapes for this wine were picked at -10 C or colder; cold enough to freeze the berries solid. During pressing, all the sugars, acids, and flavour components slowly drip out, leaving the berries’ water content as ice in the press. A natural concentration results, with no altering of the delicate fruit flavours. The sweetness is balanced by the concentrated acidity and tannins. Icewine can be likened to a liqueur, having however lower alcohol levels more typical of a table wine. Rich soft tannins balance this wine, resulting in a symphony of flavours; reminiscent of a port, but with more initial fruit flavour. A dreamy delight accompanying chocolate, nuts and cheeses….or as a dessert on its own. The epitome of wine. Nature’s gift to mankind as liquid gold. Click for a detailed wine profile sheet. If you're drinking our award-winning 2015 Cabernet Franc Icewine, Click here for a wine profile sheet. 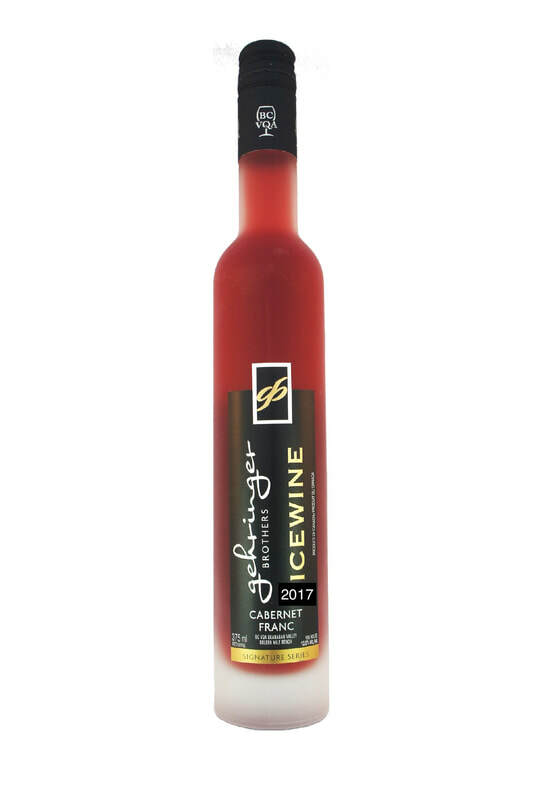 If you're drinking our 2014 award-winning Cabernet Franc Icewine, click here.